Hey, I’m looking for a light, hard use folder for EDC and practical use on a farm. Would you suggest this knife or the Voyager Medium, or another blade altogether? Great question! In this case I would recommend the American Lawman. It’s a little bigger than the Voyager Medium, I think you will like it more for hard use on a farm. Both are very sturdy knives, I think they are great choices. If you want another recommendation the Ontario RAT 1 is another great option for around $30. I’ve got a review on it here. However, if you can swing the extra $20 for the Lawman you will get better ergonomics and a slightly stronger lock. Thanks again for the great question. Hope this helps! Of the two, which do you think is sturdiest? Tough question man! Honestly, I think they are about equal. Sorry this isn’t making your choice any easier, but you have thick G10 handles on the AL and Grivory over aluminum liners on the Voyager. There is no blade play in either and they are both extremely sturdy knives. I guess if I had to choose it would be the American Lawman. They are very close however. 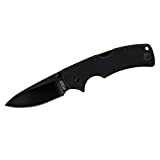 Thank you for your reviews, they allow me to see a little more about the knifes that I am interested in, right now I am thorn between the Hold Out II and the American Lawman. I want an every day knife that can double as a back up camping knife, I like the knifes and the rest of my tools to feel sturdy, even at the expense of some extra weight, (Actually I think that I like them a little on the heavy side), a friend recommended the Benchmade 520, which is about 1 oz heavier than the Lawman. Finally the question, how does the Lawman compares to the Benchmade 520? Thank you so much for the very nice comment man, I am so happy to hear you have been enjoying the reviews and you find them helpful. That means a lot to me. To answer your first question, I would honestly recommend the American Lawman over the HO2 – at least for the uses you described. The AL is much more practical for EDC, and I think it will work better as a folding camp knife (although I tend to recommend a large and sturdy fixed blade as a camp knive – maybe something like an ESEE 4). To answer your other question, I do not have much experience with the presidio unfortunately. But having handled so many Benchmades and looking at the specs for the 520, I have *some* idea of how it might perform. Compared to the AL, I think it has better steel, and will deploy faster. I also happen to prefer the axis lock over the Triad (for EDC at least, it’s a very convenient lock). I also tend to prefer the clip BM uses with the 520. That said, the AL has better ergonomics (well, the ability to choke up with that choil at least). Personally, I think the extra cost of the 520 is worth it, but I do like the American Lawman a lot. It’s a tough call, they are both good knives – I think ultimately you have to decide which one you like more (and whether you are willing to pay more for the Presidio). I hope this helps a little. Once again, thank you for looking into it for me, you have made my decision making process easier. Thanks Marco. I am glad I helped make the process a little easier. Often the best answer is “buy both” – but that isn’t always possible. If I can ever provide assistance on something else, please don’t hesitate to get in touch. I always enjoy your reviews. Thanks for hours of useful intertainment. Thank you, Alex. Your kind comment is greatly appreciated. The American Lawman remains in my collection and is one of my favorites, so I am not surprised to learn this is what you chose for Africa. That is just a testament to how good the knife is. Thank you again for reading, safe travels, and carry the Lawman in good health. I’d just like to clear up that last bit in my comment. I think it’s not wise, especially in a foreign country, to advertise that you have a knife by clipping in your pocket. So, when I trave, the knife bounces in the bottom of the pants pocket. And the Lawman, as large as it is, doesn’t bother me at all. I don’t feel it there. I just wanted to add that it’s not my favorit knife but the one I trust the most. Thanks for the clarification, Alex. It’s a good tool. May not be the sexiest piece, but it gets the job done. Since there are no liners and it’s a relatively flat knife I could see how it would carry well floating in the pocket like that. Dan, help me out. I have a ~$100 to spend on a new folder. The new Lawman with CTS-XHP steel, Griptilian, or the Paramilitary 2? All three are excellent knives and I still have all three in my collection (although my American Lawman is in AUS-8). You can’t go wrong either way so I’d pick out whatever resonates the most with you. Sorry I can’t be of more help. I guess if I had to pick only one I’d go with the Para 2. But years later I still regularly carry and use all three of these. Do you any intent on purchasing the new American Lawman with the CTS steel? Or would you say this review applies to both the old and new variants since your review is so glowing to begin with? I still own and enjoy my original American Lawman, so I doubt I will buy one in CTS-XHP any time soon. I do own a CS Ultimate Hunter in CTS-XHP, and plan on buying a Code-4 in CTS-XHP at some point. I think this review will apply to both knives, as they appear to be virtually identical, except that the CTS-XHP version will obviously have the better steel. Oh okay, the Amazon link doesn’t work anymore so I was wondering if it was any different – do you mind updating the Amazon link? I was thinking of buying one, and I would love to support the site! Thanks for the heads up, Andrew. I fixed it. Let me know what you think if you do decide to go with the American Lawman. Another great review. I’ve had my eye on the AL for a while. I’m glad I held off because of the updated version. It has great steel., DLC coating and thinner handles. I would prefer a stonewashed blade even over the new DLC. My tastes have changed and I’m thinking about selling 8-10 knives with DLC coating or similiar. I’ll live with it on a couple knives. I can’t wait to get my hands on the new AL. However the new prices I’ve seen are almost double-$89-$95. There is a limited edition OD green I’ve seen at a couple of online dealers that is really nice. I own about 40 knives. Most are very good such as Paramitary 2s. Military, Manix 2 LWs, Benchmade 950 Rifts and Griptillians. ZT 0562. However, this CS AL may be better then all of them. Not as pretty but a stronger and better user. I’ll update you when I have it and it gets some use. Just wanted to leave my experience with Cold Steel customer service. I bought a new CS Code 4 spear point (excellent knife). The lock was very stiff and hard to close the blade. I have very large hands and strong fingers. My wrists are thick, I’ve had watch bands that wouldn’t fit around them. So, this lock was really stiff. I contacted CS via email. They replied the next day. Two days later I received a UPS pouch with postage on them. Several days later I received an apology note and a new knife. Excellent Customer Service. I hear so many horror stories about people dealing with knife problems and companies. I was pleasantly surprised. Thanks Again for all your excellent info. Thanks for the kind comment. I have not owned a DLC coated blade in a while for whatever reason. It’s probably my favorite coating for a folder, but then again, I’m not a huge fan of blade coatings in the first place. I will be curious to see what you think of the new American Lawman. I have a new Code 4 sitting on my desk that I have been carrying and using. It’s a nice piece – very thin, which is great in the pocket, but not so great in the hand. A couple years ago, I was reading too much on internet. I was purchasing knives that were thin and easy to carry (Code 4, Endura). Lesson learned. My big hands don’t get a good grip on the handles. Although they are still useable. I apologize for my glowing comment on Code 4. It’s still a beautiful knife. A full sized BM Griptilian fits me much better. My pinky just hangs onto the back of handle. I did pick up the new American Lawman. It’s a nice knife and much different then the original. The G10 is toned way down (almost like Spyderco G10. ), it’s much lighter. I haven’t had a chance to use it but will comment when I do. Ironically, the handle is a little on the thin side. Not as bad as the Code 4. I’m surprised I have not seen more reviews on it and wonder how it’s selling. About 2 years ago, I sent an email to CS about a problem with the lock on one of my Code 4s. I raved about the knife. And told them, they should make some lighter , thinner, more main stream knives, I can picture Lynn Thompson, Demko and staff in a conference room with my e-mail enlarged on a screen. And Thompson asking who’s idea was it to listen to this idiot from Boston ? Thomas, No problem man. I appreciate your updating us on your thoughts with regards to the knife. I agree that the Code 4 is not a comfortable knife to use hard with a bare hand. While I love the slim nature of the handle, it digs into your palm and is uncomfortable if you are going to use it for more than a minute or so. It might make it better for defensive uses than if you are say, a worker at a warehouse who breaks down boxes routinely as part of your job. Your comments on the new American Lawman make me interested in picking up the new version myself. I figured they would just slap CTS-XHP in there and call it a day. It sounds like they have made some tweaks to the handle as well. Thanks for your thoughts, Thomas. Much appreciated. I just wanted to add, the fit and finish on the new AL is very good. For a Triad lock, it is very smooth. I’ve also handled a couple new Recon 1s with the upgraded steel, DLC etc. Good fit and finish. They also had smooth locks. Sometimes the Triad locks are very clunky and hard to depress. These were pretty smooth. All 3 knives lock up tight and are centered. The new G10 is hard to describe. It’s toned down. Still a little coarse but not really rough. A little like a Spyderco Tenacious but coarser. The new Recon 1 feels lighter but it’s size etc . seem close to the original. They are all still very sturdy, hard use knives. I don’t know if anything I said helped anyone. Again, I’ll briefly describe my experience once I use the new AL. My Lawman have steel liners. Is an older version? Maybe? Or maybe it is not an American Lawman. Do you have any pictures of it? I got one too. It’s real, alright. An older version, with drilled-out liners, and even jimping on the spine of the blade. It’s about 5 1/2 ounces. Otherwise, almost identical. The same old, rough G10, Triad lock, Aus8 with the flakey black “Teflon” coating… There’s an old review of it on YouTube, by Fred Perrin, no less. Interesting! Thanks for letting us know.